Velan Info Services (India) Pvt Ltd (Velan) is a successful IT & ITES offshore business process outsourcing (BPO) service provider with an impeccable track record of delivering services to its clients in North America, Europe and Australia. Velan’s outsourcing services help to focus on your core business and result in an increased revenue, competitive edge, and market share. One of our key outsourcing services of Velan includes Virtual assistance. Velan’s Virtual Assistance service offers administrative support and other specialized services to businesses, entrepreneurs, executives, sales professionals, and others who have more work to do than time to do it. We provide you extremely talented virtual assistant with experience and good educational background. We have pool of talented and experienced professionals who are extremely workaholic and have excellent communication skills. Our staff can work up to 24 hours a day, 6 days a week maintaining consistent presence online and offline. We can ensure an extremely suitable service with our experience and team efforts. We are strategically organized to be competitive in price and to offer quality service. 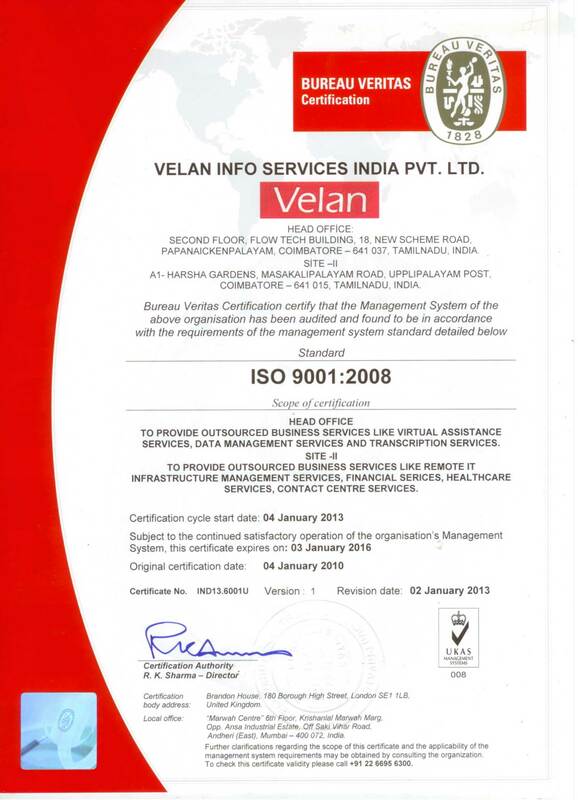 Velan has built-in redundancy for all mission critical resources..